A Neat Way to Use A Wheelbarrow. I Can't Wait to Try Back Home. The Indians Fought with Bows and Arrows, The Spainards Had Guns. Guess Who Won? Last night, Imam made me an Elephant out of the towels. He didn’t look in character with my bears, stingray and penguin but he was different. Today is February the 12th. It is the birthday of Abraham Lincoln, our 16th President, and also of Charles Darwin, in whose tracks we are following on this cruise. Darwin and Lincoln not only share the same day but also the same year as their birth. We are currently in the Chilean fjords on a heading of 344 degrees NNW and at Latitude 52 24.06” S and a Longitude of 073 40.75” W. From the plot on the map we are approaching Isla Esperanza (Island of Hope) on the starboard in a very narrow channel. We are spending two days at sea cruising the fjords before stopping in Puerto Montt. 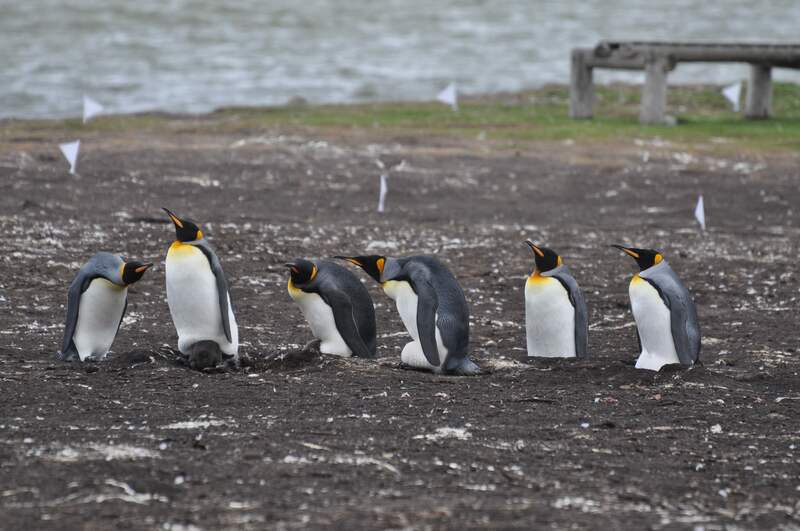 I am going to try to make two posts today: 1) will deal with Punta Arenas itself, which was anti-climatic after Ushuaia and the Beagle Channel, and 2) our visit to the Otway Sound Penguin Rookery (Magellanic Penguin variety). Those penguins and there antics probably deserve more than one post. We’ll see. Punta Arenas or Sandy Point in English is the largest most southernmost city in Chile and could be said in the world by population since it has more people than Ushuaia. It is in Punta Arenas where the people going on the excursion to Antarctica will leave by plane and land at a Chilean Air Force Base. There they transfer to an ex-Soviet icebreaker and do about 3 hours of cruising then back on the plane for Punta Arenas and the ship. My Dad says they are being charged $3,999 for this excursion, when you can use the same airline and get a five-day cruise of Antarctica for $5,900. So, he has decided that when I am 12, we will come back just to explore Antarctica. 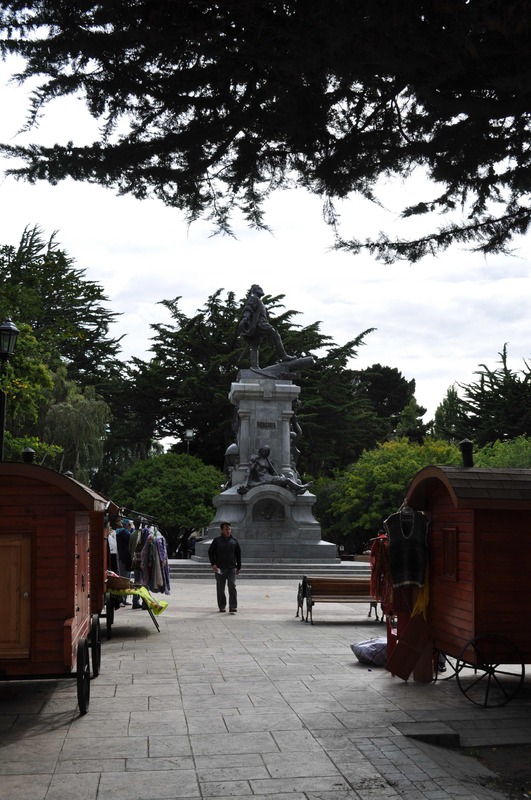 We grabbed a taxi on the pier (the pier is way outside of town) and drove into the main square (Plaza Munoz Gamero) with a beautiful central monument to Hernando de Magallanes (Magellan as we know him), the first sailor to circumnavigate the world. 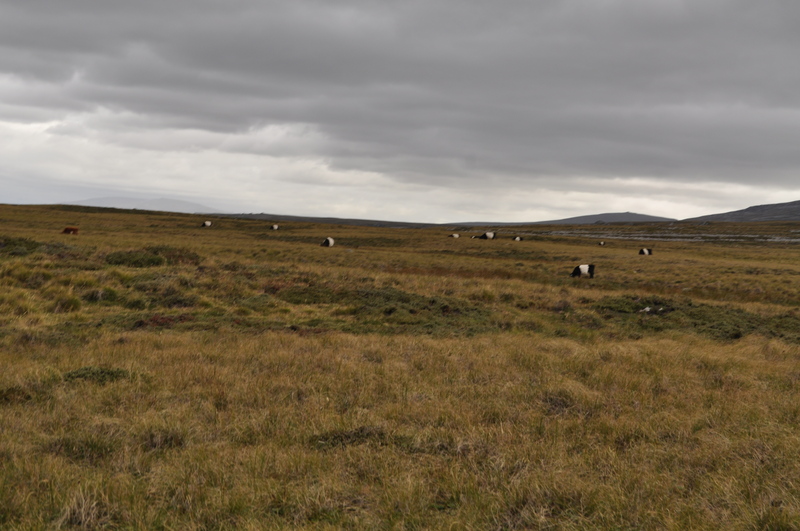 We came up the Estrecho de Magallanes (Straits of Magellan) to Punta Arenas. From the Plaza we went directly west, across the street, to the Cathedral where we said our daily prayers for everyone but especially our men and women who serve our country. 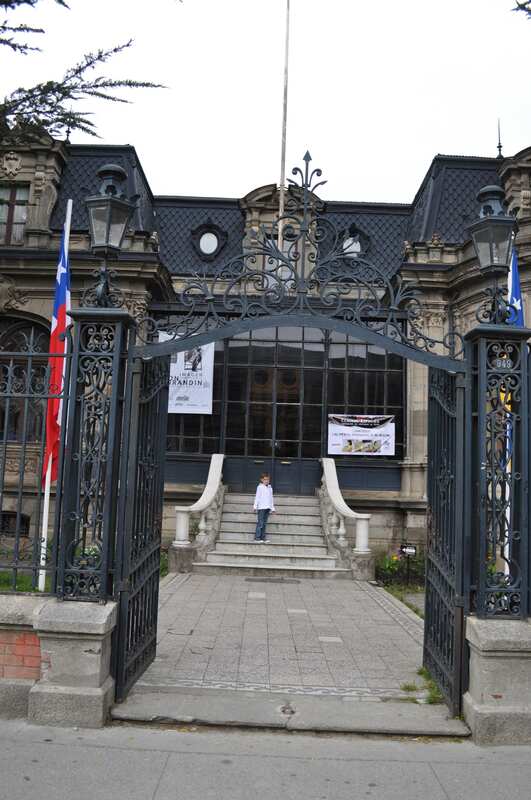 We then went to the Magallenes Regional Museum, which is housed, in the old Braun-Menendez Mansion designed by the French architect Antoine Beaulier. 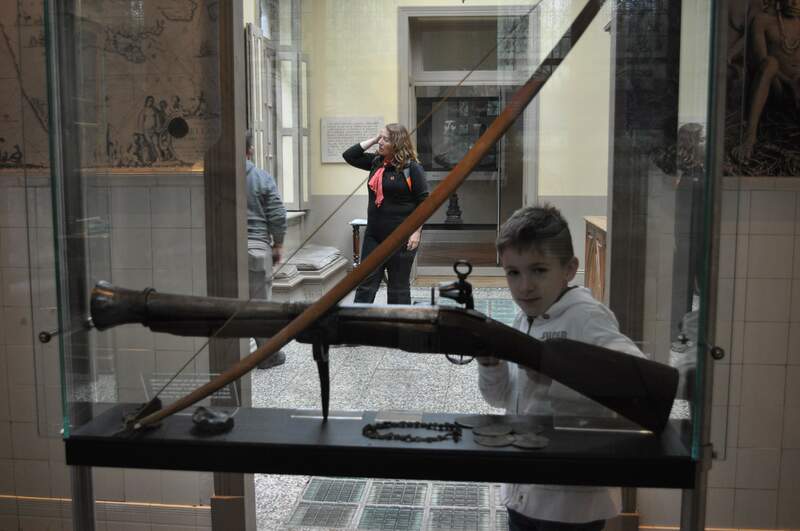 It has a great collection of not only the period furniture and home wares that came with the house but also items from the full history of Patagonia, including bows and arrows and Spanish muskets (Blunderbusses). Further down Ave. Pedro Montt, was the Chilean Naval Museum. My friend Grace and her family were also there. 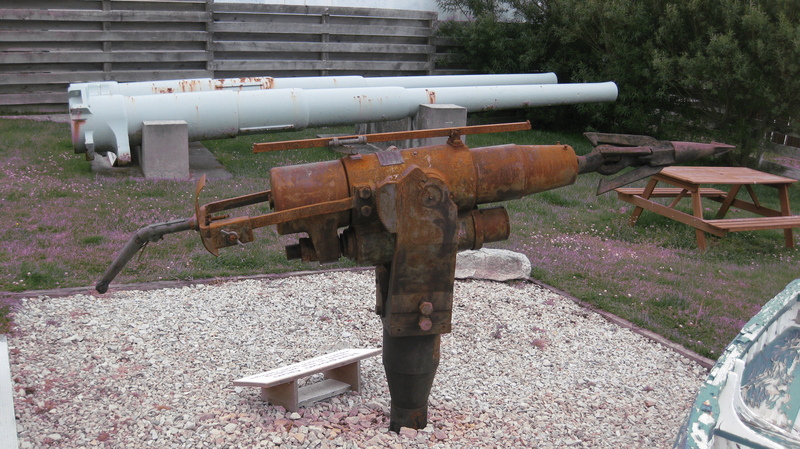 The museum had displays of torpedo, mines, machine guns and diving suits. 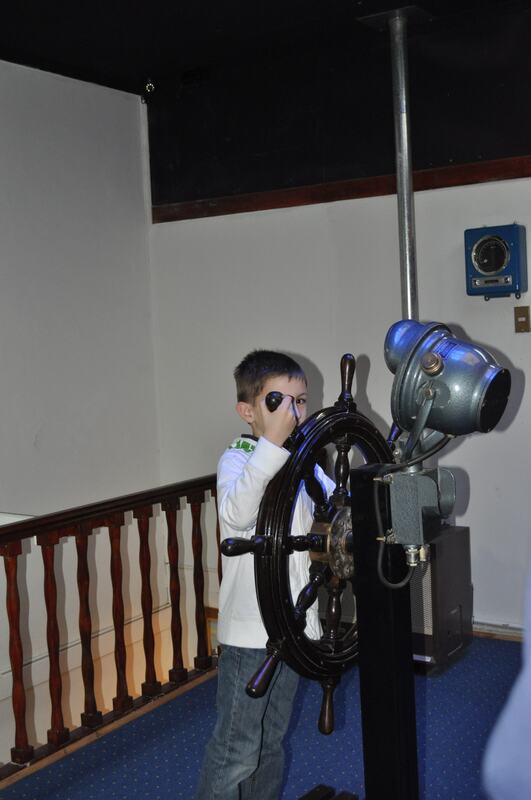 There was rooms set up to resemble the bridge (where I took my place at the helm), weather room, communications/radio room and officers mess. My Dad showed Grace and I how to use the telegraph key to tap out our names in Morse code. We met some people from Georgia who were going on a National Geographic cruise to Antarctica and they told us about a little bistro down the street that had great food. It was called La Marmita and the food was really good. My Dad had the best Ceviche he says he ever had, a soup based on a Chiloe recipe. Chiloe is a very special island in the fjords before you get to Puerto Montt with its very own distinct culture and history. Then he had ravioli stuffed with carrots and ginger and an herby tomato sauce. My Mom also had he ceviche and special pasta with salad. I shared my Dad’s lunch. There was a little park across the street and it had seesaws which we took turns bouncing me up and down. 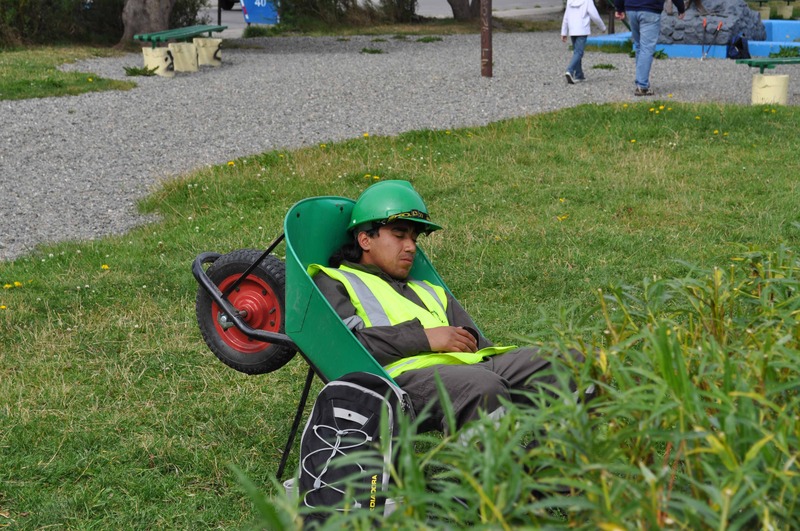 My Mom got a great picture of one of the workers taking a siesta in his wheelbarrow. This is Frederick and I found Punta Arenas interesting but not as much fun as the Penguin trip, which I will tell about next. To Mrs. Fazarri and my classmates, Adios con dios and hasta lluego. I miss you all. 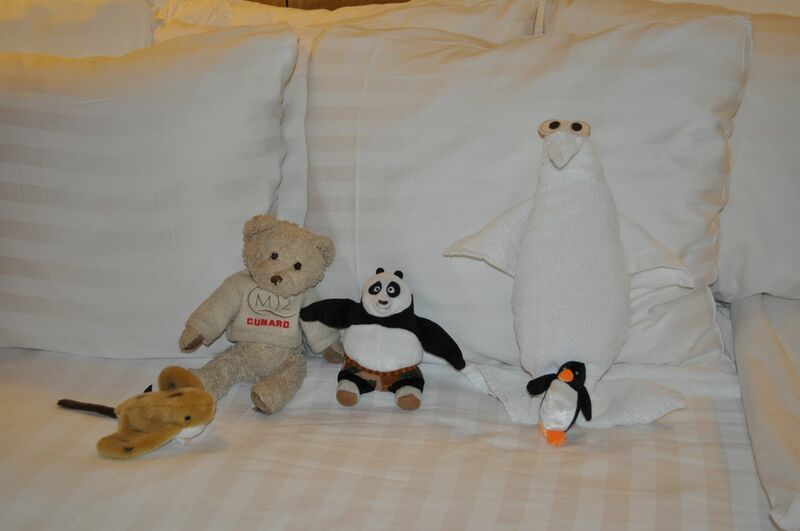 Waiting for me last night after our dinner was a Penguin made out of towels by our steward Imam. He told me he was making me a monkey but I like the penguin better. We are currently on a heading of 008 degrees (N) at 8:29am ship’s time or 11:29am GMT. We are in the Straits of Magellen, heading for Punta Arenas, Chile, at 53 13.16” S and 070 48.02” W, with an apparent northerly wind of 37mph. The ship is cruising at comfortable 17.0kts. 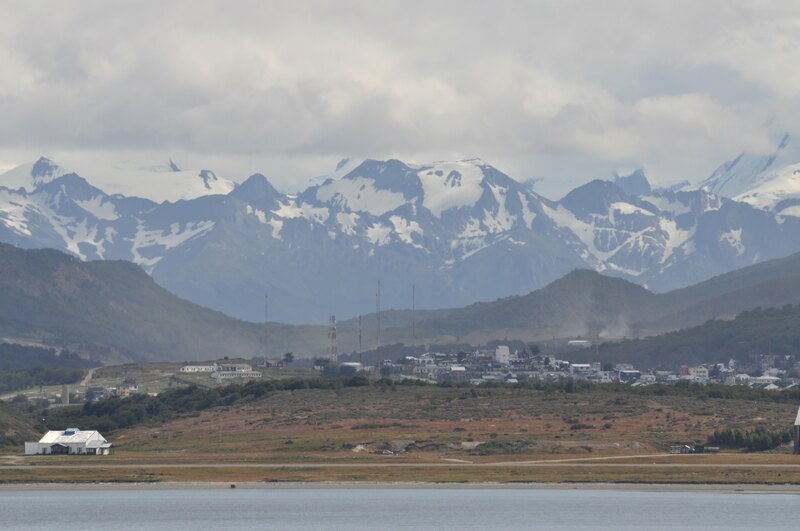 Last afternoon, we left Ushuaia on a Southeasterly course to skirt the necklace of islands on its starboard side. Then we entered the Beagle Channel where Charles Darwin sailed on the HMS Beagle, as official naturalist, during its world voyage of 1831. 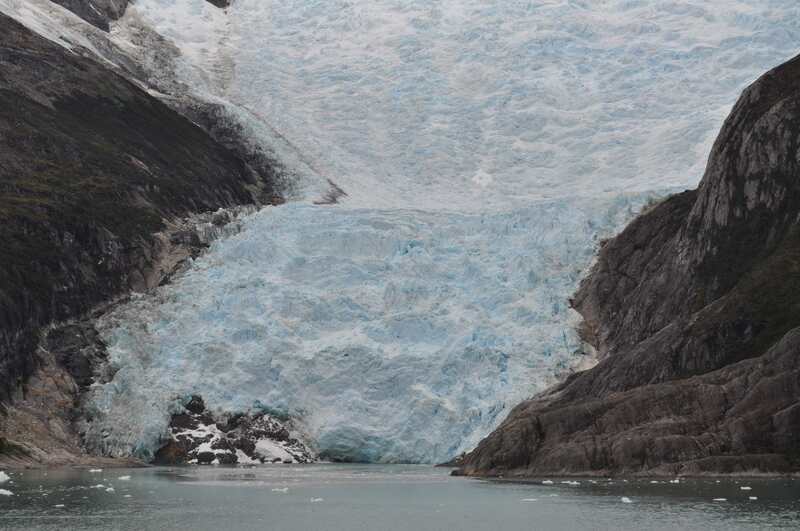 On the starboard side of the ship (where our cabin is located) you see the magnificent Cordellera Darwin and its array of imposing and impressive glaciers. It is going to be hard to identify each of them but I will try with the help of my Dad, a map and my Mom’s photographs. But it was the most beautiful natural scenery I have ever experienced. 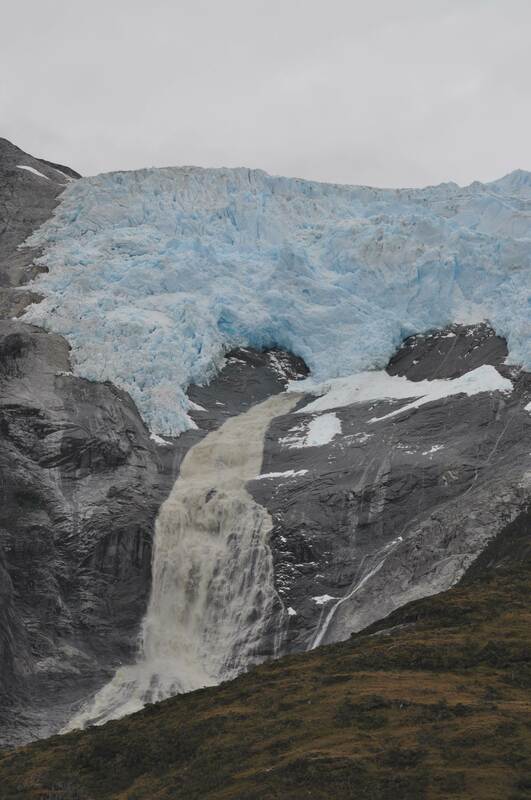 There was no sign of life except for the occasional duck floating by, sea birds soaring on the thermals and in one area of thundering waterfalls a small lodge, probably for the intrepid visitors to this remote part of our world. I can only let the pictures speak for themselves. We only have a short interval to post and I want to share as many photos as possible. But when we get back home I will have them all up on Flickr for everyone to enjoy. This is Frederick and I love science and have read about Darwin in my class taught by Mrs. Fazzari. More, about our Punta Arenas walk-around later today. Early this morning, while I was sleeping, we pulled into Ushuaia. Thanks to my Mom, you have the pleasure of seeing the approach to the harbor and our pier in Ushuaia. It is the further most southernmost city in the world. 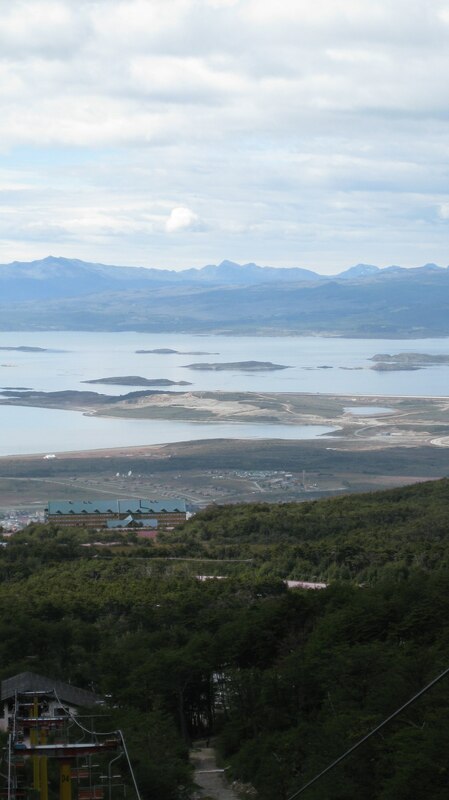 The Chileans claim Puerto Williams, south across the Beagle Channel is but it is more a town than a city. After breakfast in our cabin, we decided to go directly into the city. It was very warm, over 66F with a chance of showers later. As we walked down the pier we passed an icebreaker turned into an Antarctic cruise ship, a custom sail yacht like none other ever seen, a research ship for the Argentine navy and a commercial fishing vessel that my Dad says is a big-time seine netter. We walked past little shops on the pier selling everything from duty free liquor to jewelry to leathers. Then we passed out onto Avenida Maipu, which is the main street along the harbor. From there we found a taxi to take us up to the Glaciar Martial where we can catch a chairlift up another 1.8kms and then hike some more up toward the glacier itself. It was not open when we got there so we joined some people from Chile who are on our ship and went to a little Cabana de Te next to the lift and had coffee, tea, hot chocolate and scones. 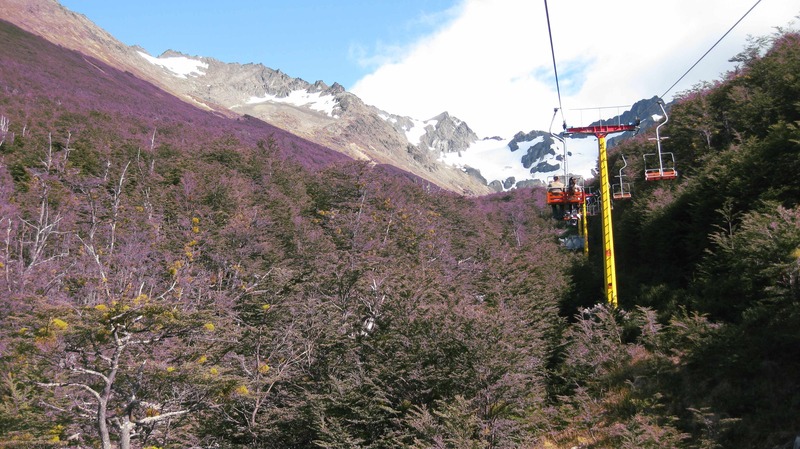 By the time we were done the lift had opened and we got in line to buy tickets (boletas) for the chairlift. My Dad and I took the first one and my Mom the next one so she could take her pictures. Along the way, we saw people hiking back down from the upper platform (platforma superior) and a flowing creek that sounding like a rushing train as the water flowed quickly over the rocks. 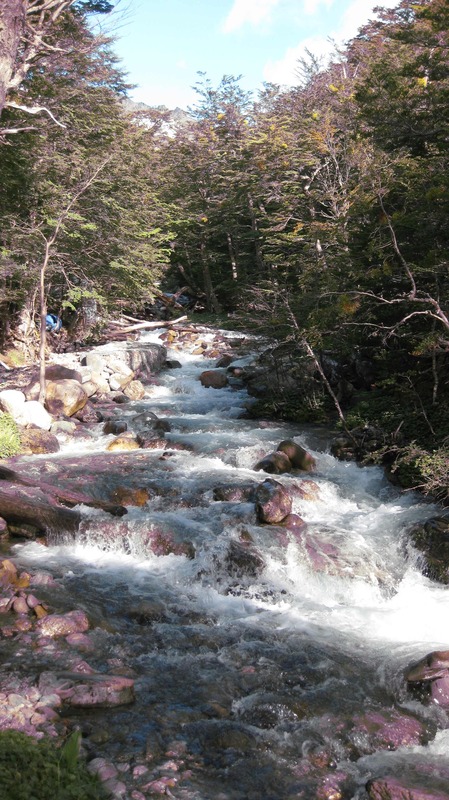 My Dad said that would be the purest water you ever tasted since it came from the snowmelt on the glacier and was filtered by the stones and air all the way down to the reservoir in Ushuaia. We hiked up the mountain (montana) some and took lots of pictures, then came back to the upper platform to take the lift back to the lower platform (inferior platforma). From there we took a taxi back to town and found a few shops for souvenirs. I bought a compass to help me understand were we were and were we are going. My Dad bought a photo book about Ushuaia. We ate lunch in a little restaurant named Tante Sara. My Dad and I had vanilla milkshakes and burgers while my Mom had a glass of wine from Chile. 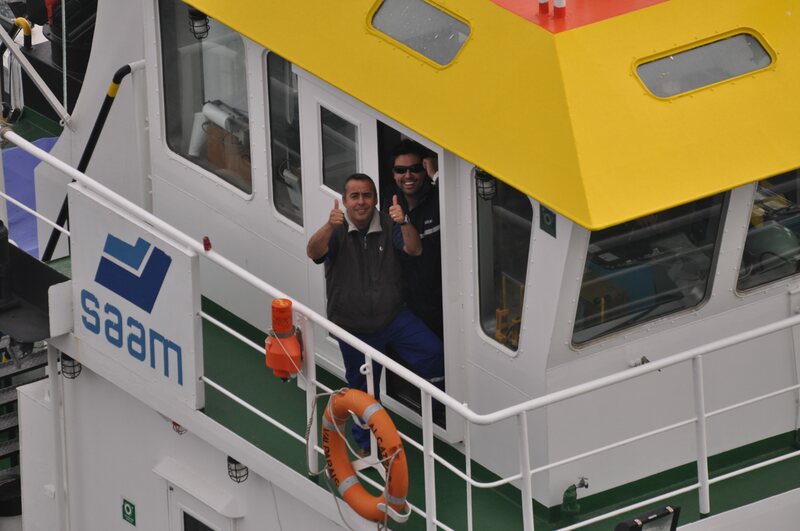 We then walked back to the ship because we had to be on board by 2:30pm. A very short stop. This is Frederick and I just saw the most beautiful mountains and glaciers I have ever seen. 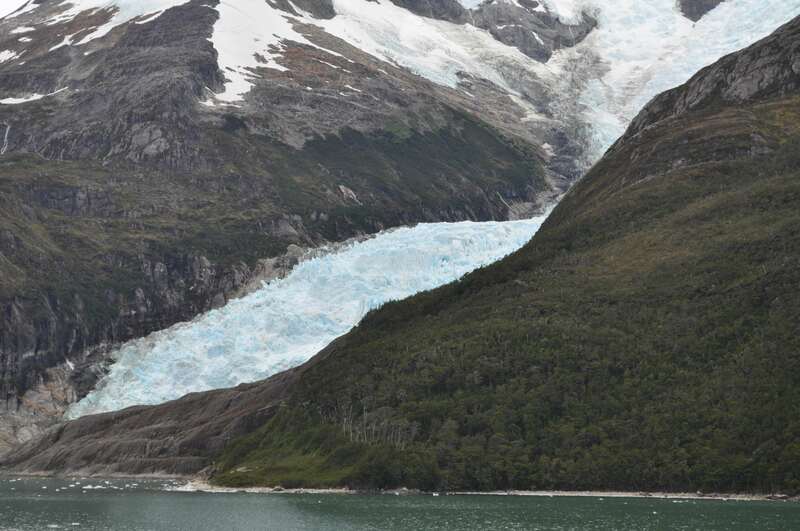 Later today, when we cruise the Beagle Channel, past the Cordillera Darwin, I hear we will be in breathtaking country. I can’t wait. Tomorrow I will post the Beagle Channel but only after we leave Punta Arenas. 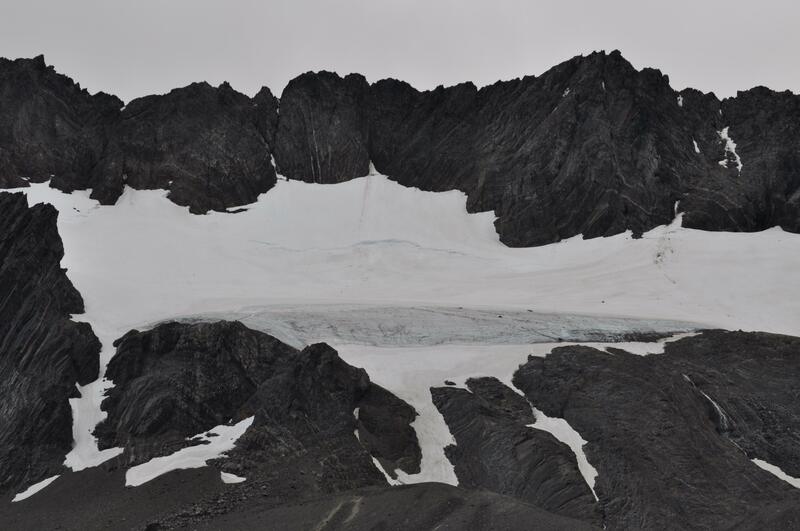 Then, it may be that we have to suspend the blog due to lack of reception in the Chilean fjords. 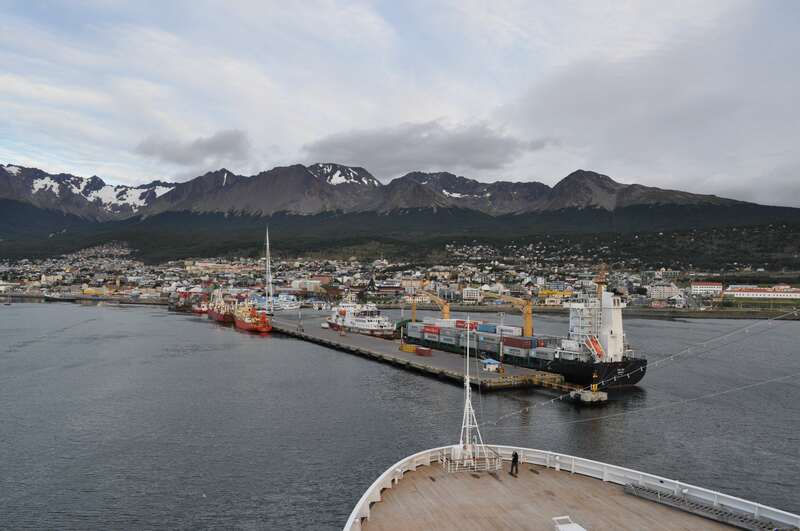 Today we arrived in Ushuaia, after sailing up the Beagle Channel over-night. So, we won’t have any pictures of the Channel but will have some after we leave Ushuaia this afternoon. When we left Port Stanley we set out on a Southwesterly direction passing closely to the Isla De Los Estados, which at one time was a penal colony. My Dad says if it was a penal colony, then the guys at Gitmo have it easy. It was the most desolate Islands I have ever seen. 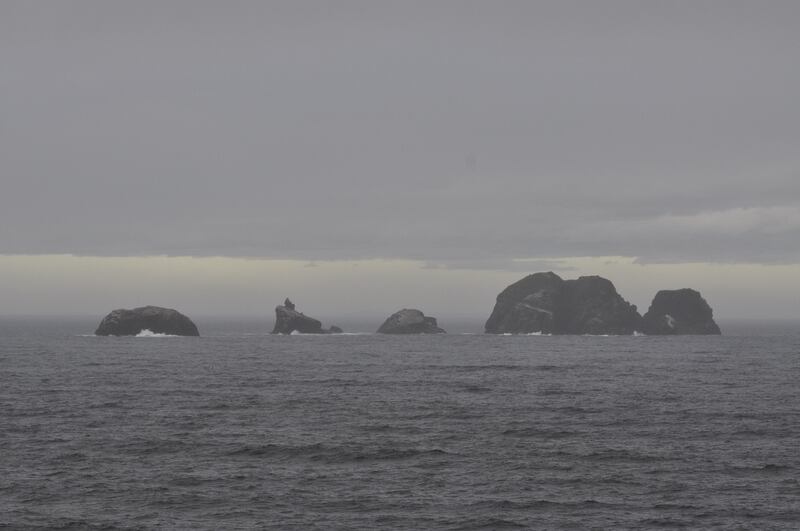 They are the tip of the Peninsula Mitre, of Chile. 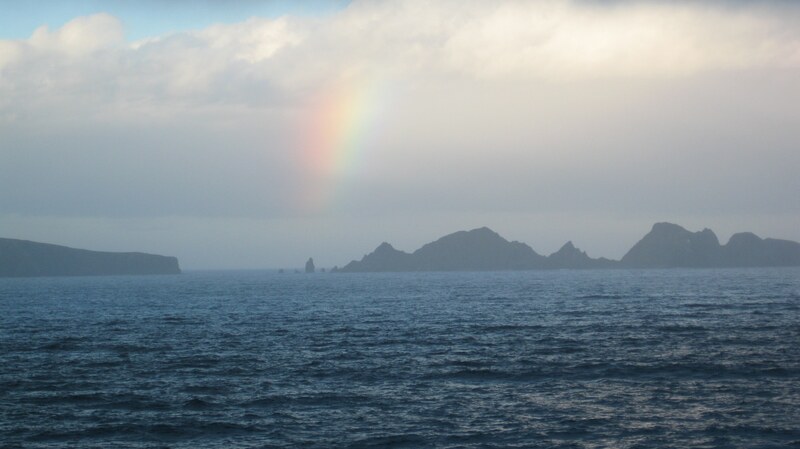 Then we continued on West Southwesterly heading toward Cape Horn. Our passage was filled with random shapes of rocks and islands that only the bird life and water life like seals could love. Very dark, cold and lonely. It was after dinner and before dark when we came up on Cape Horn and turned right for the Beagle Channel. It started to rain and the wind picked up. 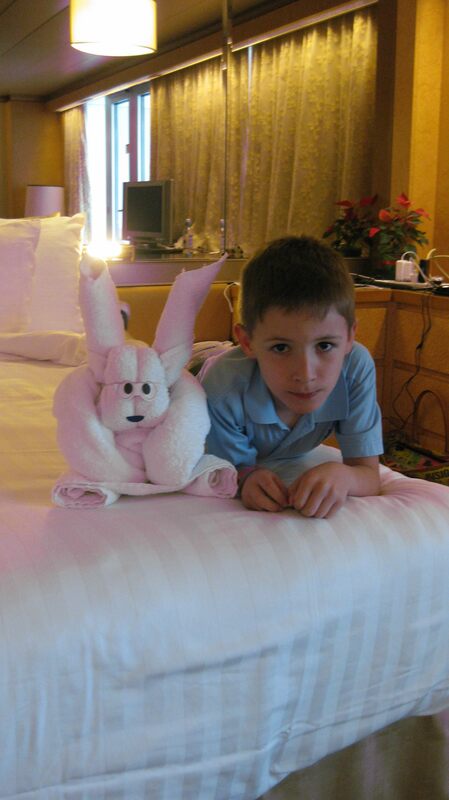 When we got back to the cabin, Imam had made a Bunny Rabbit out of the towels for me. He is so creative. Tomorrow he has promised a monkey. My Mom got lots of great pictures, too many to post now. So, what I have posted are just a selection of what I saw. There were lots of birds and they flew close to us, as if they were welcoming us to their place. 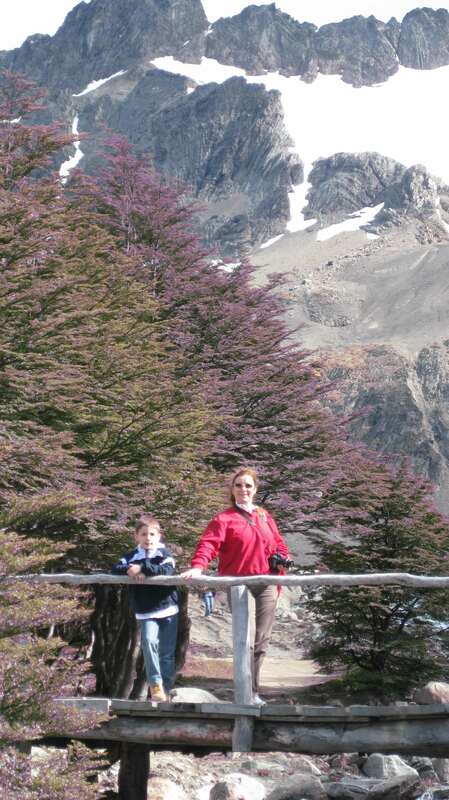 They are very brave to live in such a desolate but still beautiful place such as Cape Horn. This is Frederick and I am learning about the Southernmost inhabited place on earth. 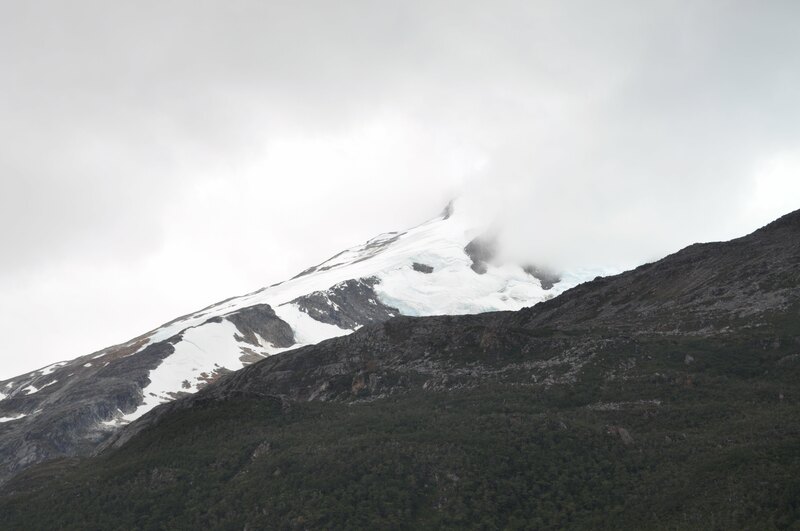 Next post is about our approach to Ushuaia and our trip up to the Glaciar Marital. 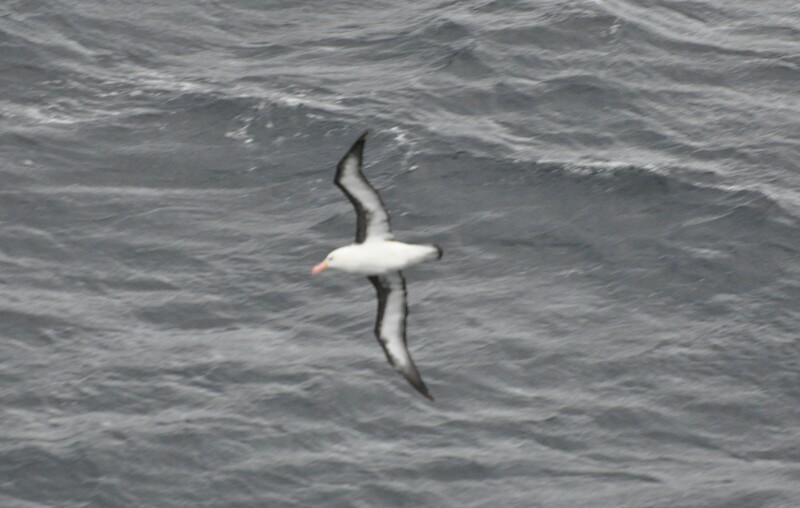 As We Approached Cape Horn This Storm Petrel Appeared For Us. It looks like we are getting better reception and speed. Let’s see. After we stopped from our little “walkaround” we had a pub lunch in The Globe near the meeting point on the pier for the Bluff Cove Penguin Rookery tour. After lunch we met up with the tour people and got on our buses for the first leg of the journey to Bluff Cove. Our driver was Trudi and she was funny. She was also a pretty tough lady who didn’t mind reminding people to put on their seat belt. 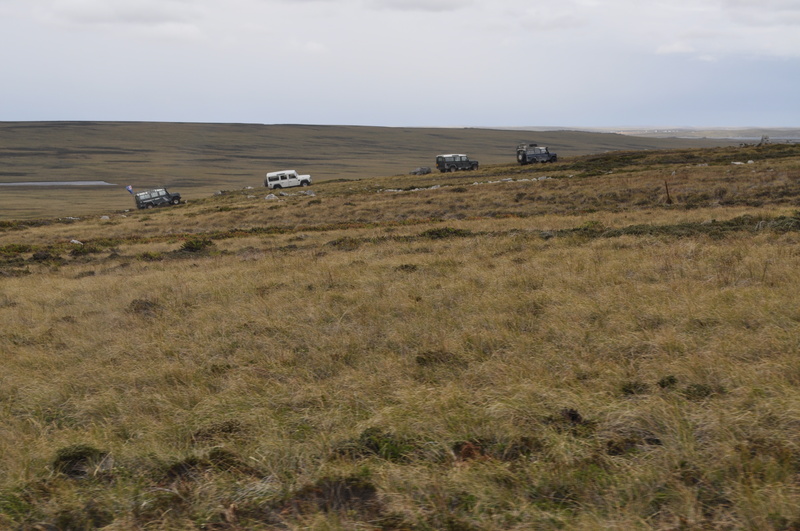 After about a 10 mile trip down the highway SW of Stanley we arrived at a small turn-off and parking area where there were 5 Land Rover/Defender series 4X4 wating for us. Each one took 4 people, so, mom, dad and I got in the one that had a set of bullhorns mounted on the roof. A man from New Zealand named John got in with us. The driver’s name was Charles and he was Trudi’s husband. Their son drove on of the other Defenders. Charles drove down the highway another mile and then turned left into what looked like a giant pasture but was a rock-strewn moraine that ran down to a small valley and then up again. I was able to follow on a little map they gave us of the Bluff Cove Rookery. It was very bumpy and difficult but Charles knew what he was doing. He was a sheep and cattle rancher and a farmer. The drive was very interesting as we were literally in an ocean of rocks tumbled and folded over and over – it was like a scene out of some space movie. After crossing Gator Bridge and Stone Ridge we were able to see the cove and lagoon in front of us about another 500 feet down the moraine. Bluff Cove is actually a 36,000 acre ranch with 150 head of Belted Galloway cattle (my dad said they are all named George?) 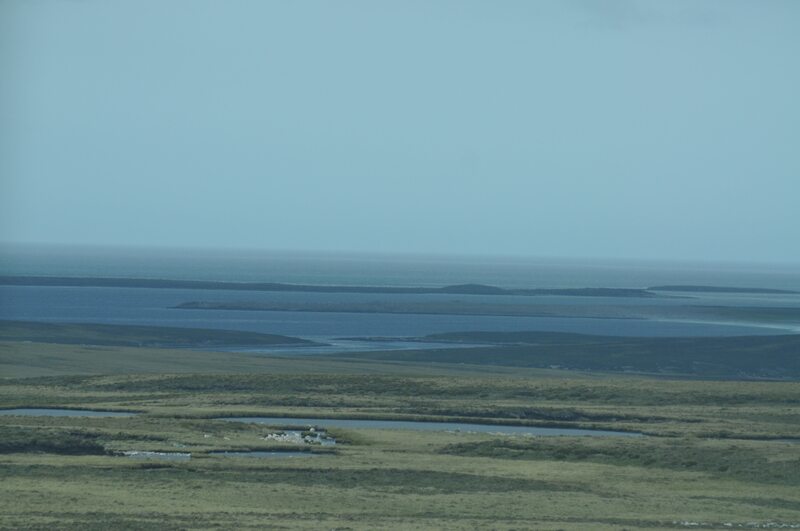 and 3,000 Perendele sheep as well as the penguin rookery and miles of beaches on the lagoons. After we arrived in Bluff Cove, we were dropped off at the main rookery up from the beach. 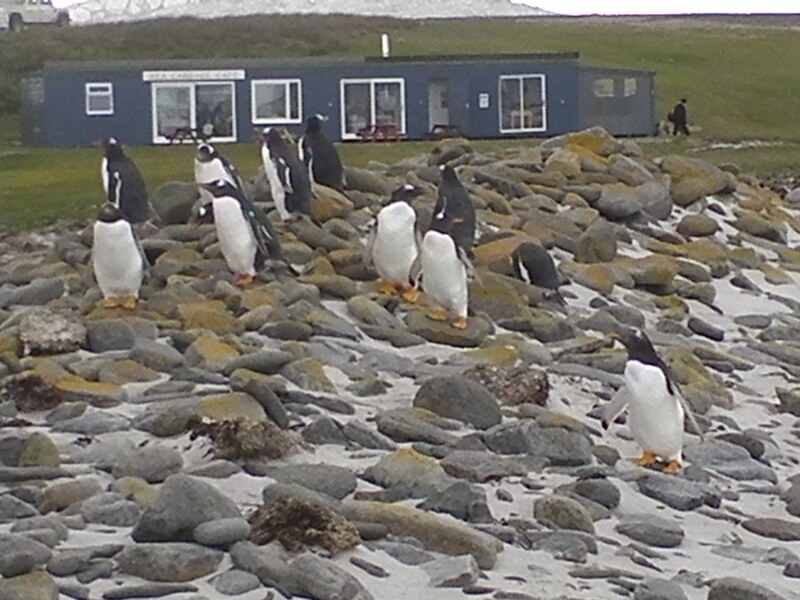 There were a number of King penguins there either in the process of hatching or covering and feeding new chicks. My Mom got some great pictures that I hope to post soon as the reception improves and the speed is better. 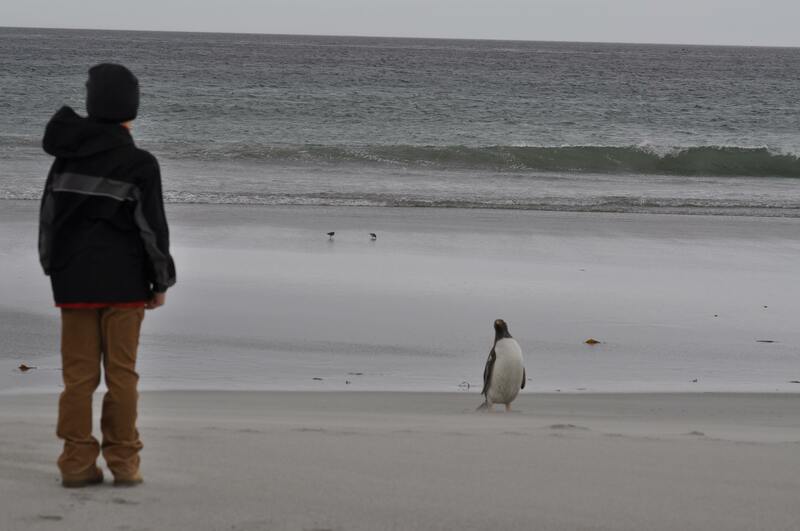 Then we walked down to the beach and watched a whole bunch of Gintoo penguins walking on the beach or the stones or out in the waves. It was like the penguin version of Southampton, Long Island, where I was born. I will never look at Little Plains beach the same. After watching these funny little creatures we walked over the rocks to Bluff Cove’s Sea Cabbage Café for coffee, tea and delicious cakes. My dad loved the scones with clotted crème and local diddle-dee berry jam. Mom had tea and scones also. A lady played the accordion and did it by ear. Her first song was “West Virginia, Mountain Momma” and my dad sang along but out of tune. After that we looked into the museum and a young girl was playing local folk songs on guitar but we had to go back to our 4X4’s and return to the tender pier for the ship. It was another tough drive back along the moraine and in fact, my dad says it is one of the most remarkable drives he has ever taken. 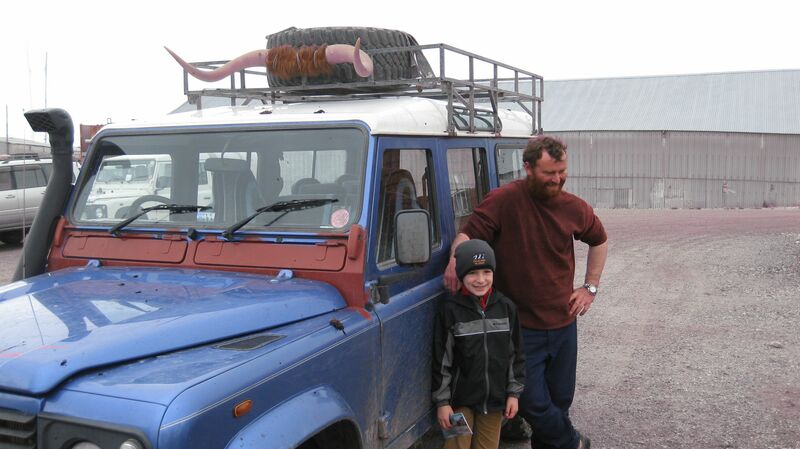 When we got back to the pier, I posed with Charles, who I think is the best off-road driver in the world. This is Frederick and my adventure is just beginning. Later today we are going to see Cape Horn and then sail up to the Beagle Channel on our way to Ushuaia. My Dad Calls it "narciso" but To Me it's A Harpoon. Today we pulled into a little cove outside of Port Stanley to anchor the ship. The Stanley harbor is not dredged deep enough to take large cruise ships. So, we had to use the ship’s tenders, for a 15-minute ride to the pier. Once there I told my dad that I wanted a hot dog (it was only 9AM but I didn’t like my breakfast). There is a little open snack stand at the pier with a nice lady who speaks like she is from England. After the hot dog we went into the visitor’s center and picked up a more detailed map and booklet about Stanley and The Falklands. We decided to walk down Ross Road, the main street along the sea front, and just take pictures, explore what was there and go to the museum down at the end. We saw Christ Church Cathedral (the main Anglican church), that has 4 huge Blue Whale jaw bones outside, and we went inside to visit Then we said a small prayer. 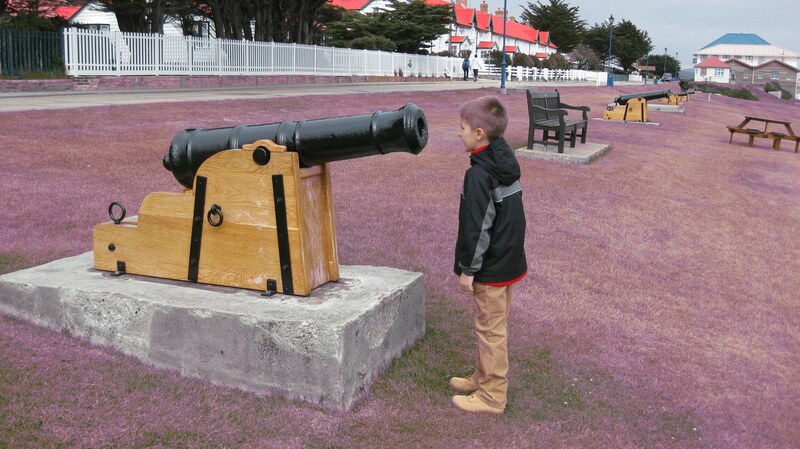 We then came upon a small park area on the seafront with old cannons and the mizzenmast from the ship Great Britain, which was the first iron ship with steam boilers and is now restored and in Bristol, UK. We then proceeded down the road to the bank where dad got some Falkland pounds even though they take US dollars everywhere but at a higher rate. Next-door was the Post where we bought collector’s stamp at the special philatelic shop and got some postcards to send back to my school, godmother in France, my godfather in England and my Grandfather in Belgium. I also sent a card to my class in Florida and one to our own home as a souvenir. Falkland Island stamps are a real collectors item, so my dad says. We then walked by the memorial to the brave British service members killed during the Falkland War in 1982. It is in front of Government House and facing the sea. 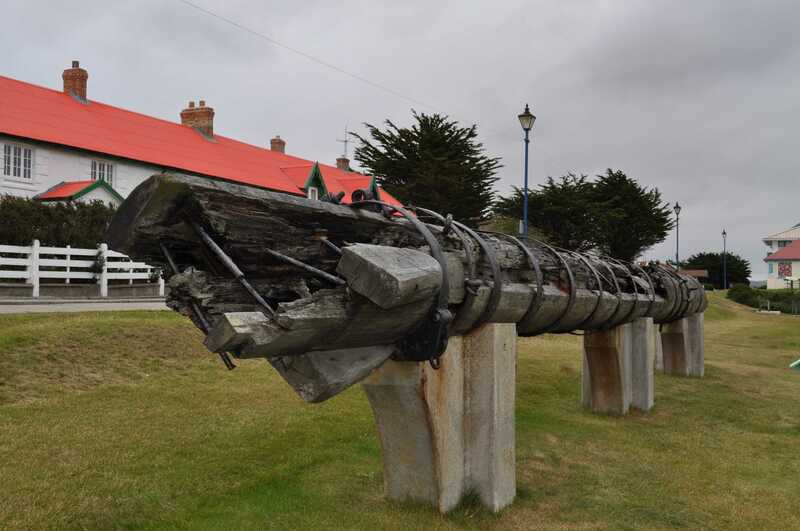 Next, was the Governor’s House, built by the first governor of the Falklands, in 1845. There are beautiful gardens in front and my mom took lots of pictures of the flowers. We passed the victory memorial to the Falklands War and finally came to the museum, which was pretty neat. It had a lot of guns, rockets and bazookas from the war as well as Argentine Air Force helmets and old uniforms. It also had a replica of an old country store and a dentist’s office. Outside there were an old red telephone box, some boats and a harpoon cannon that was used on the last whaling ships. After that visit we grabbed the shuttle bus back to the pier to find a pub to grab some food before we had to meet up for our trip to the Blue Cover Penguin Rookery. That pub turned out to be The Globe, just up the street from the pier. My dad had fish and chips and mom and I shared a burger and chips. I wasn’t that hungry since I was too excited about going to the rookery. This is Frederick and next is the biggest adventure I have ever been on. p.s. Very slow today on the Sat. We may have to wait until tomorrow for more. 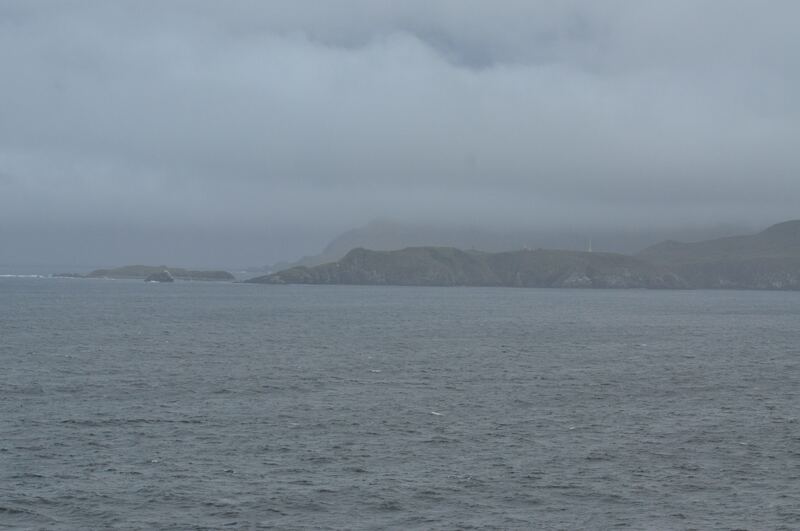 We are currently passing The “Isla de Los Estados” to turn up into the Beagle Channel and toward Ushuaia. 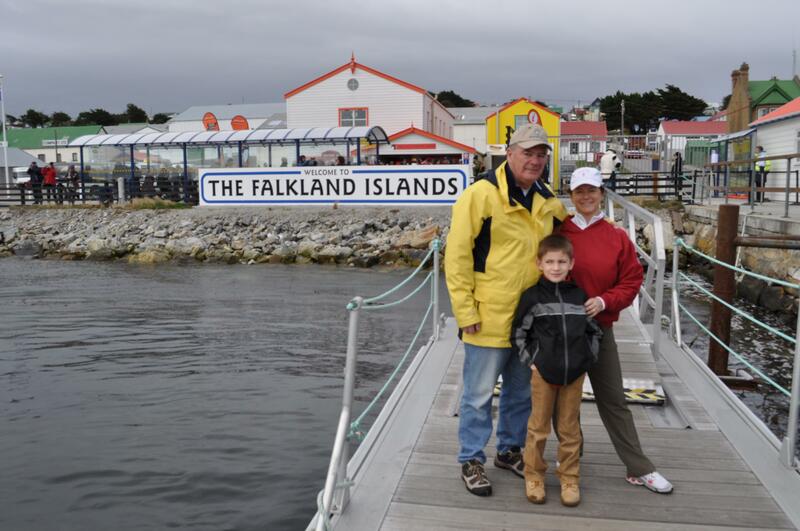 Finally, Port Stanley and the Falkland Islands. This morning it is partly cloudy and chilly. We are approachging Port Stanley, The Falkland Islands on a heading of 220 degrees at a position of 51 37.39″ S and 57 38.13″ W. We are running at 18.1kts with a following wind of 11mph. I will post more after our visit to town and the penguin rookery. Last night I went to the movies with my friend Scott and his parents. He is from Canada and wears wheelies which are shoes with roller wheels on the heels. He can do all kinds of tricks on them. 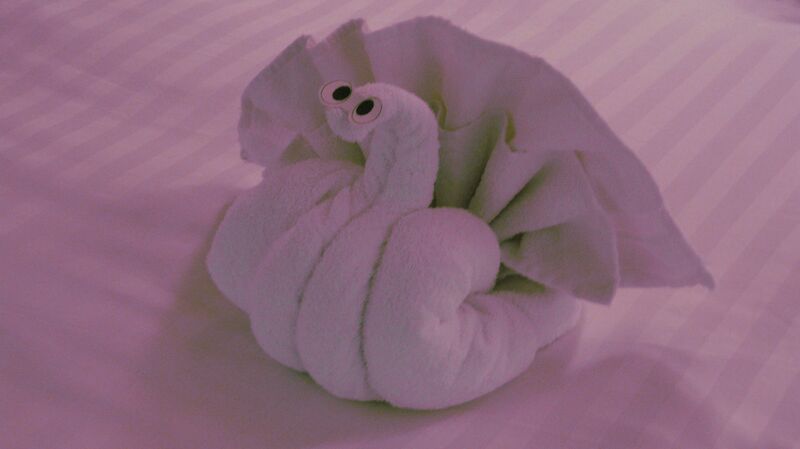 When I came back from the movies I found that Imam, our steward, had made me a Peacock by folding the towels in different shapes. Imam is from Indonesia and has three daughters waiting for him to return. His leave starts on the 16th of February when he flies out of Santiago back to Indonesia. This is Frederick and I am ready to meet the Penguins.